Coming hot on the heels of a year in which total Mercedes-Benz unit sales increased by 44 per cent – and organisational changes – the goals of expanding market share and building an even stronger presence in all market segments will continue to occupy the organisation’s focus, both locally and internationally. Scheduled to arrive here in the January-March period will be a new ‘dream car’ in the shape of the S-Class Cabriolet, a model that will bring the joys of open-top motoring to the premier S-Class range. Also in Q1, the E-Class range – which already includes saloon and estate models – will take another leap forward with the arrival of an E-Class Coupé followed in mid-year by an E-Class Cabriolet. 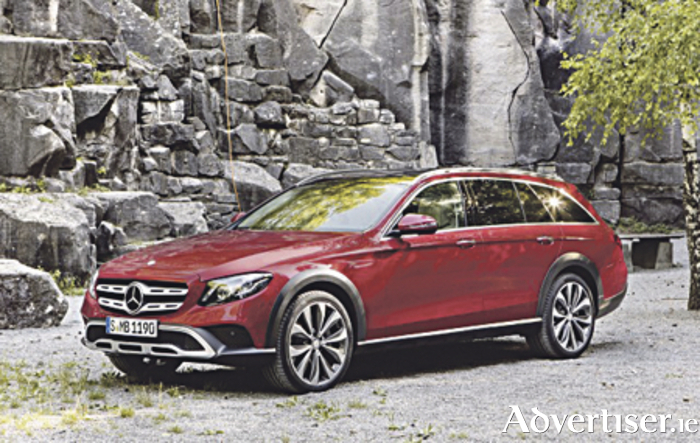 Also arriving in that period will be a new E-Class all-terrain model and a revamped GLA entry-level SUV. As 2017 progresses, it is expected that Mercedes-Benz will advance developments already in the pipeline, one being their entry into electric-powered motoring discussed at the recent Paris Motor Show. It is expected also that Q3 will see some finessing at the very top end of the model range though details have yet to be made clear. In this context, two especially exotic AMG models will become available – a GTR and GTC – of which more details will be revealed in due course. Commenting, Ciaran Allen, sales manager for Mercedes-Benz passenger cars in Ireland, said: “Over recent years, as new models have become available, we have seen Mercedes-Benz expand its base in city and suburban driveways, in rural environments, and amongst younger drivers, male and female. “As models due here in 2017 indicate, this new approach is now an embedded element in the unfolding Mercedes-Benz story as the company plots its course towards 2020 and the expected doubling of its market share globally,” he said. Contact Michael Moore Mercedes-Benz on (090 ) 6403000 for more details.